Beautiful You: What's In My Shower Tag! What's In My Shower Tag! I had next to no inspiration for today's blog post but I have been tempted to do this tag for a while so I just thought that I would bite the bullet and go for it. I know it is something slightly different than usual but I love reading what other people use because I'm always up for trying new body and hair products! Basically I am just going to talk through my normal shower routine and give you guys an insight into what products I use and how I sometimes change it up too! Lets get to it, firstly before I go in the shower I remove my contact lenses, remove my makeup and cleanse my face; if you would like to see a 'get unready with me' post let me know in the comments! 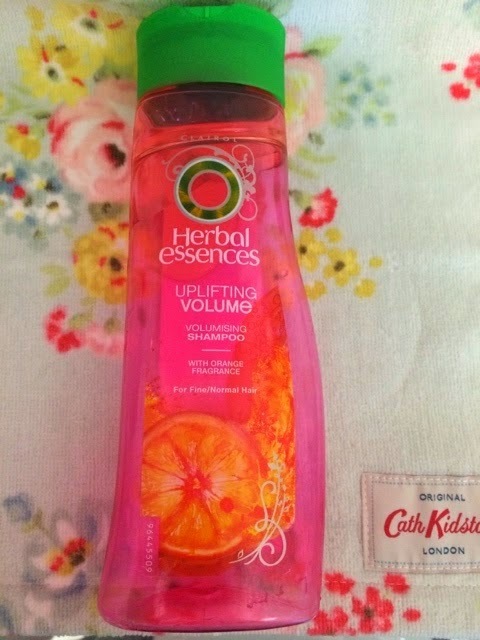 Once my face is clean I then get in the shower and get my entire head of hair wet, then I lather in my shampoo of choice, at the moment it is Herbal Essences Uplifting Volume one which smells amazing and does give your hair a lot of volume and bounce in my opinion! 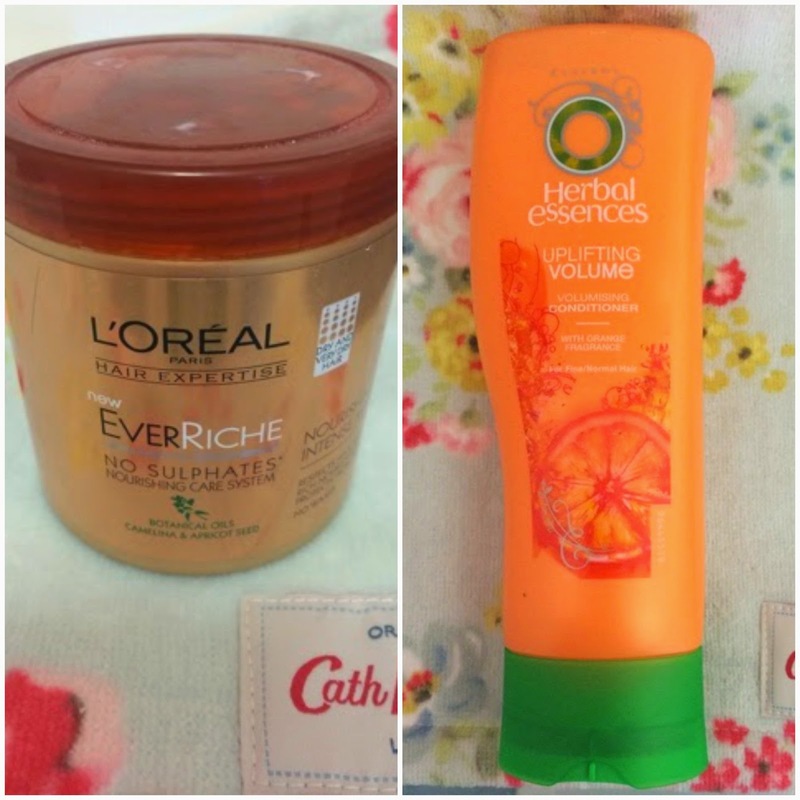 Once I have rinsed out the shampoo I will move on to conditioner, I have recently been using the Uplifting Volume one Herbal Essences five days a week but then on Sundays and Wednesdays I use a deep conditioning mask. This just helps to give life back to my hair and to make it look and feel a lot smoother and shinier! The one I am currently using is the L'oreal Ever Riche Mask and I am loving it so far, I usually use the Vo5 mask but I thought that I would give something else a try! While the mask or conditioner is sitting in my hair for a while I will wash my body and to do this I have several products that I like to use. 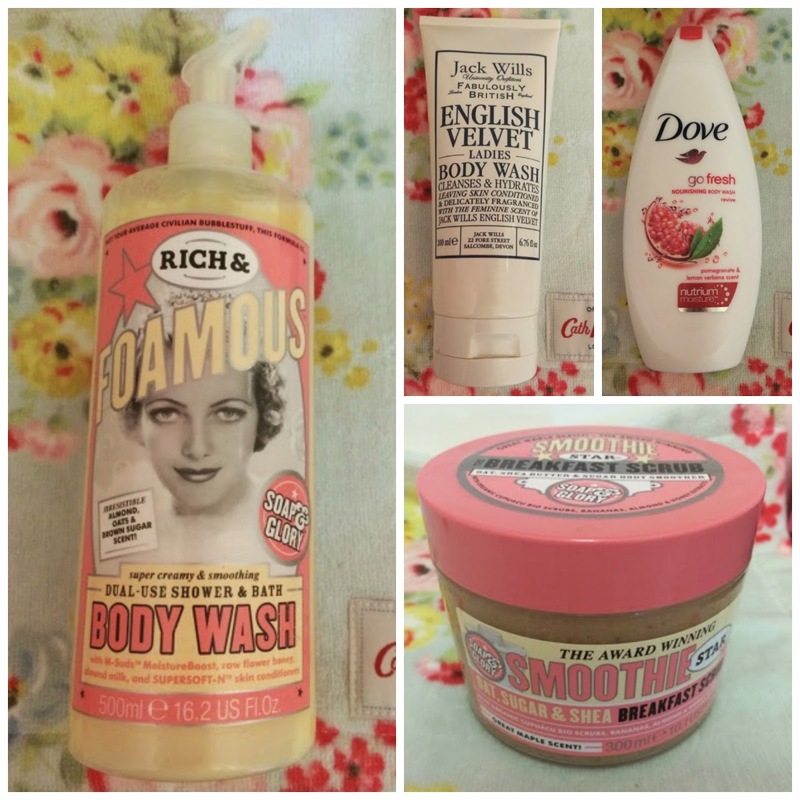 Currently my go to body wash is Soap and Glory 'Rich and Foamous' body wash, this smells soooo good and it is the same scent as my moisturiser and I cannot get enough! If I am going out and I am having a shower before I will use the Jack Wills 'English Velvet' body wash because I love the smell and I again have matching body lotion and I find that the smell lasts such a long time and I like that if I am going out! Then last of the shower gels is Dove's Go Fresh, I use this if I am having a shower in the morning (I usually have them at night) as this is a very refreshing scent! Then if I am shaving my legs or anything like that I will exfoliate first using Soap and Glory's Smoothie Scrub, I cannot explain to you how amazing this smells but take my word for it, b-e-a-utiful! Once I have rinsed of my shower gel and washed myself I will then rinse my conditioner out too whilst brushing through it with a wide tooth comb because I have really long hair and it would be a nightmare to brush out completely if I didn't do this step! Then I am clean and ready to get out the shower, I have quite a simple routine and I don't use many products but I hope you enjoyed this none the less! Thank you for reading today's post and let me know what your go to products in the shower are and if you are going to buy any of these! Also usual, I will insert links to my MAC giveaway here and my twitter giveaway here, this ends on Friday so get your entries in! I have a special thank you that I need to add on the end of this because my blog reached over 100 followers on bloglovin last night and I cannot express to you how happy I was. I was texting my sister and Becky (a blog friend) and when I reached it I burst into tears and I was over the moon. I owe that all you guys and never in a million year did I think my little blog would have over 100 followers, so thank you so so much! If you are a new follower, welcome to the Beautiful You community and I hope you love my blog as much as I do! See you on Wednesday! I really want to try that Loreal mask, sounds amazing! Loved this post! I used all the soap and glory smoothie star range ahhh it smell divine. I also use the loreal hair treatment it works so well! Thank you for your link to this lovely blog - new follower here!